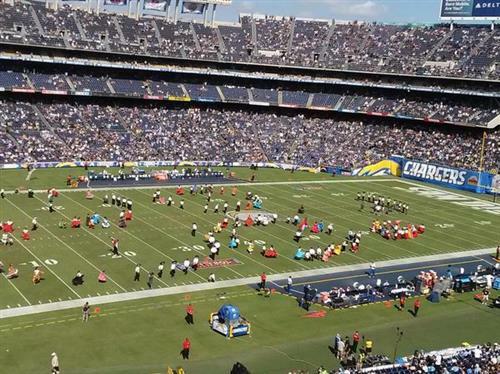 Live updates from the Chargers season home opener with the Lions. Should be> RT @BFTB_Chargers : Chargers could be up 24-14 next time the Jaguars offense gets the ball. 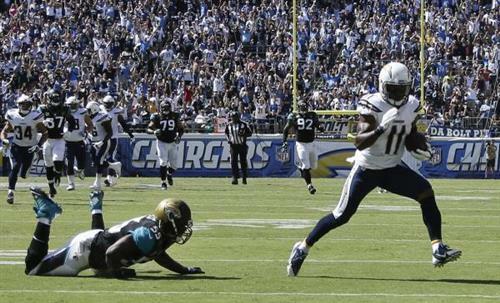 Keenan Allen has 64 yards receiving today before end of 1st half vs. #Jaguars . Had just 109 total in first 3 games this season. Now would probably be a good time to drop the unwarranted arrogance, #ChargersTwitter . Your team is losing to the 0-3 Jaguars at home. Good to have Troutman back in there. #sarcasm RT @SkinnyDuzIt : 63 just standing around, B. Now they look like an injured team. #Chargers go back ahead on long TD to Eddie Royal. #Chargers need a quick stop here. Get ball back to start second half. Must keep pressure on. Eddie Royal sure is great when healthy (and used properly). I get the feeling Eddie Royal is beating the #Jags all on his lonesome... Because he is. Eddie Royal had two TDs of longer than 26 yards in his career before today. He has a 47- and a 43-yarder today. #Jags HC Gus Bradley is scooping less vanilla than his mentor Pete Carroll did vs. #Chargers here in Game 2. Rivers burned the blitz there. RT @sdutPosner : Call timeout!!!!!! McCoy ... unbelievable.>That was weird. With Jaguars unable to defend deep, why not get ball back? Chargers lead Jags 17-14 at halftime. San Diego gets the ball back to open second half. Philip Rivers to Eddie Royal for the 47-yard TD. Philip Rivers is 16-for-18 for 206 yards and two TDs. A 151.4 rating ... Season to date: 83-116-984-8-1 with 116.5 rating. The most Chargers thing ever would be beating the Seahawks and losing to the Jaguars in the same season. Chargers up 17-14 at the break. @PhilipRivers : 2 TDs -- both to @EddieRoyalWR . Second half kicking off now. #Chargers had all 3 of their TO when the #Jags got the ball with 59 seconds left in the half. Why didn't they use them to get it back? Shareece Wright questionable to return with a knee injury. Chargers confirm Shareece Wright has a knee injury, return is questionable. Keenan Allen with season-high six receptions and 77 yards. Swing pass now serving as a run for Chargers' offense. #Chargers offense is four plays into the third Q. Team's rushing total for the game: 7 yards. But if Jaguars insist on not covering any receivers downfield, you might as well throw.